If you have a dream to explore any tourist destination in India and want to Travel with a luxury vehicles, it can be true because you are at right place. 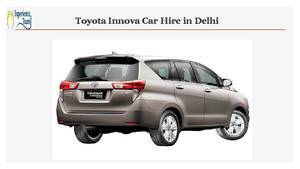 We are best Travel and Tourism Agency in New Delhi and have made a reputable name in industry to provide Hire Toyota Innova car service in New Delhi from more than 10 years. Toyota Innova car considered an ideal vehicle for family trip, weekend trip or pickup and drop service from Airport and Railway station. We ensure to you that our Innova car hire service will best journey of your life and you never forget because we love to share happiness with our customers.